Our Territory Manager Kyle recently travelled to NSW demonstrating some of our latest and exciting additions to the greenPRO range! Introducing BioWeed Organic herbicide, the ATV Towable Steamer, the new Golf Reel and our Award winning GPI-100 Solar Powered Travelling Irrigator. Kyle’s journey involved speaking with local contractors, councils, farmers, schools and golf courses who all have the same issues with ground maintenance for schools, paddocks, sporting fields and equestrian facilities…. With a common question raised ‘How do you maintain your grounds and surface in a sustainable and affordable way?’ Easy, if you own a piece of greenPRO equipment. His first stop was Armidale, where he met with council members and subcontractors who where keen to know more about the ATV Towable Steamer and Bioweed Organic Herbicide. A demonstration of both products proved successful which generated an opportunity to speak with the University of Armidale and NEGS. An agricultural school committed to finding and using more sustainable options for their grounds. 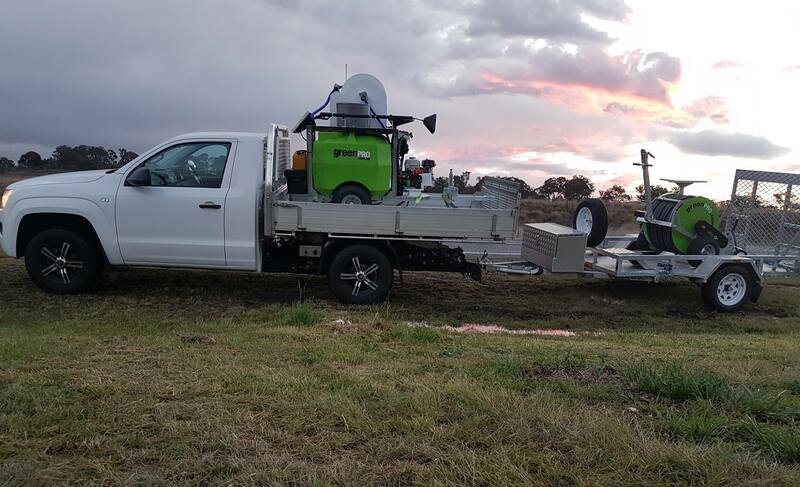 From Armidale to Tamworth he managed to visited a number of prominent golf courses show casing the latest Golf Reel as well as BioWeed Organic Herbicide. One of the key benefits of the Golf reel is that it can save maintenance staff hours in labour when soaking their greens and fairways and is portable. Whilst in Tamworth he also managed a visit with the Australian Equine and Livestock Events Centre to discuss how the greenPro greenPRO range could benefit their facility for maintaining both the indoor and outdoor arena surfaces which accommodates all disciplines of equestrian sports. Continuing south bound, Kyle arrived in Newcastle to meet with some golf courses and even the Jockey club. Showcasing BioWeed Organic Herbicide as well as demonstrating the ATV Towable Steamer, again was a success at the Randwick Golf Course and University of NSW who could see how these products would benefit their current maintenance processes. For the first time on the trip, the Award Winning World first GPI-100 Solar Powered Travelling Irrigator was demonstrated and wowed the groundsmen of St John Paul II Catholic College so much so, they placed an order for one on the spot due to it’s retractable sprinkler technology of Set and Forget. The same day the Australian Golf Club also placed an order for the Golf reel after seeing it in action. As expected, there has been so much interest for the ATV Towable Steamer and BioWeed Organic Herbicide given a hot topic of discussion right now for a lot of people including Councils, Schools and Community Groups is about sustainable weed control and using safe products that work. Providing these demonstrations out in the field is so important for us to show people just how effective these products are, but also so easy to use and most importantly are sustainable. The final visit before heading home was with a Landcare group just outside of Kyogle. Their main interest was to see the ATV Towable Steamer and Bioweed in action. Those attending couldn’t believe the results of both products with the majority of the group quoted as saying “Amazing and just brilliant”. If you would like to book a demo with Kyle in 2019, please call us now to book in a time.